Matt Vinar wins the OWC “Grand Othello” tournament! 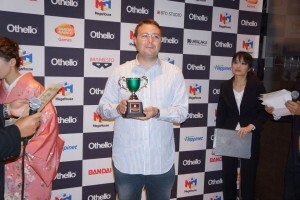 The inaugural Othello World Cup took place in Tokyo from January 23 to 27, celebrating 40 years of the game of Othello. The main tournament was won by Junya Ito who defeated Kazuki Okamoto in 2 games (25-39, 43-21) in an all-Japanese final. The women’s final was won by Joanna William of Indonesia who defeated Mei Urashima of Japan. Australian champion Matt Vinar finished 29th from 58 international players. Matt also participated in the “Grand Othello” tournament, an Othello variant also known as “Othello 10×10” which uses a board of 100 squares instead of 64. Matt won the tournament undefeated which included many world-class players! Check out the OWC website for more details on all the tournaments or Othello News for photos and player interviews. ← Matt Vinar selected for 2013 Othello World Cup!